Pictured from left are Marston's area manager Alistair Johnson, Amy Cook- Nykyforczuk, Janet Bray, The Tulip Queen manager Gary Stevenson, Inca Honnor and deputy manager Jamie Harris. Three former Tulip Queens have crowned Spalding’s newest pub and hotel. 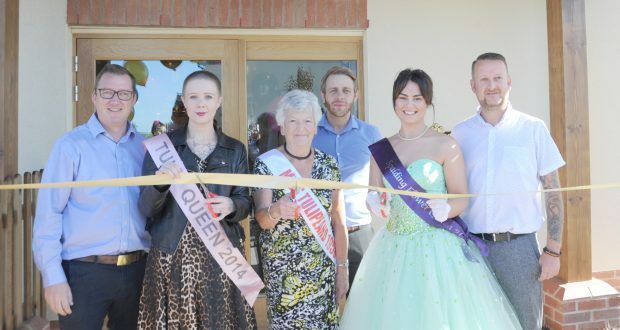 The Marston’s-owned pub The Tulip Queen officially opened its doors on Monday, September 24 and three of its former namesakes were asked to cut the ribbon on the over £4m project. The 82-year-old Janet Bray, Tulip Queen in 1958 was joined by Inca Honnor (2013) and Amy Cook-Nykyforczuk (2014) with all three stating the occasion reminded them of their crowning moments. Manager Gary Stevenson said: “The reaction we’ve had from the public so far has been phenomenal.